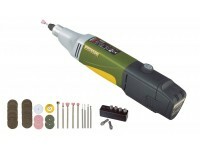 For drilling, milling, grinding, polishing, cleaning, cutting, engraving and signing. High-revving with variable electronic speed control for high torque, even in the lower speed range. Double-row ball bearing, precision spindle of ground steel and six triple slit MICROMOT steel collets (1 - 1.5 - 2 - 2.4 - 3 and 3.2mm) ensure high concentric accuracy. Bits and cutters run true! With 20mm MICROMOT collar for use in drill and horizontal stands. Supplied with 34 bits and cutters of industrial quality, all shafts Ø 2,35mm. Set includes IBS/A, lithium-ion battery Li/A (10.8 V) and rapid battery charger LG/A. 7,000 - 23,000rpm. 10.8V. Length 270mm. Weight approx. 700g (including battery).High quality 10.8V lithium-ion battery with 2.6Ah for a performance comparable to its mains-powered counterparts.